The High Cross is one of the most distinct symbols of Ireland. It is part of the Celtic Cross tradition, which includes Scotland, Brittany, Cornwall, Wales, and England. There is much speculation about the symbolism, ritual, and meaning expressed in the Celtic Cross. Its unique combination of circle and cross may suggest a melding of pagan sun-worship with early Christianity. The circle may be traced back to ancient concepts of the omphalos or center of the world. It might suggest a cosmic wheel, part of the constant movement of the heavens. Or it may derive from the Celtic artifact of the Torc or welded circle, symbolic of the strength of the gods. However we understand the Celtic Cross, it is richly representative of the distinct nature of Irish Christianity, which has always maintained its own unique traditions and its connections with the ancient Irish past and the Irish landscape. High Crosses cover the landscape of Ireland, almost always associated with the remains of the great monasteries. These monastic settlements go all the way back to the 6th century in Ireland, and constitute some of the richest and most haunting ruins in all of Ireland. Of particular importance are the magnificent crosses at Clonmacnois, Co. Offaly; Monasterboice, Co. Louth; and Kells, Co. Meath. 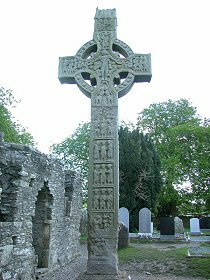 The Irish High Crosses retain over the centuries their magnificent carvings. 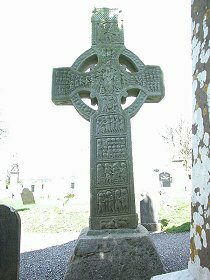 Indeed, the Irish High Cross is itself a kind of holy text: images from the Old and New Testaments, from the Lives of the Saints, and in some cases from pagan mythology, cover the crosses from top to bottom and side to side. In the pages that follow, you may view these images in detail, getting a sense both of the overall unity of the Cross and of the individual stories the Cross contains.